They’d take a piece of that tobacco, a big leaf, and they’d take ashes and they put them on there, fold it up, and they’d chew it for long time. 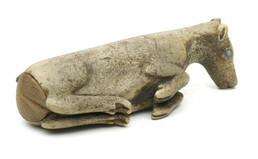 Men crafted attractive small boxes to store tobacco, this one carved from bone in the image of a caribou fawn resting on the tundra. Both men and women used tobacco, which was smoked in pipes, chewed together with ash made from birch tree fungus, or snorted as a powder. Tobacco first came to Alaska through trade with Chukchi and Siberian Yupik peoples in Siberia. Both men and women used snuff or chewing tobacco, while most smokers were men. (5) To make chewing tobacco, the leaves were chopped, mixed with ash, and kneaded into balls—also called quids or plugs—that were kept in small boxes. The ash was made by burning birch tree fungus, obtained through trade with Athabascan peoples of interior Alaska.